Our family has made its living from the fields and forests of the South for seven generations. From Maryland through the Carolinas' to Georgia, our family was here yesterday, we are here today, and we will be here tomorrow. Fifteen years ago, we started growing container seedlings. That first year we started small and grew 100,000 longleaf seedlings. We started small to learn how to grow top quality seedlings and we have certainly learned a lot since that first crop. Since that spring in 1996, our production has risen to near 13 million seedlings this year. We attribute our success to producing top quality seedlings and selling them at fair prices and always putting the customers' needs first. We will be happy to provide a list of customers and references at your request. Go ahead and check us out. Take the guess work out of buying container seedlings. Ask for Deep Plugs from Meeks' Farms. Don't accept substitutes or excuses. Go ahead and buy the six inch Deep Plug. You'll be glad you did. After sowing, the real work begins. If it was easy, then everyone would grow high quality Deep Plug seedings. Our seedlings are grown in custom designed growing trays that are specially developed to grow strong, robust, healthy root systems. 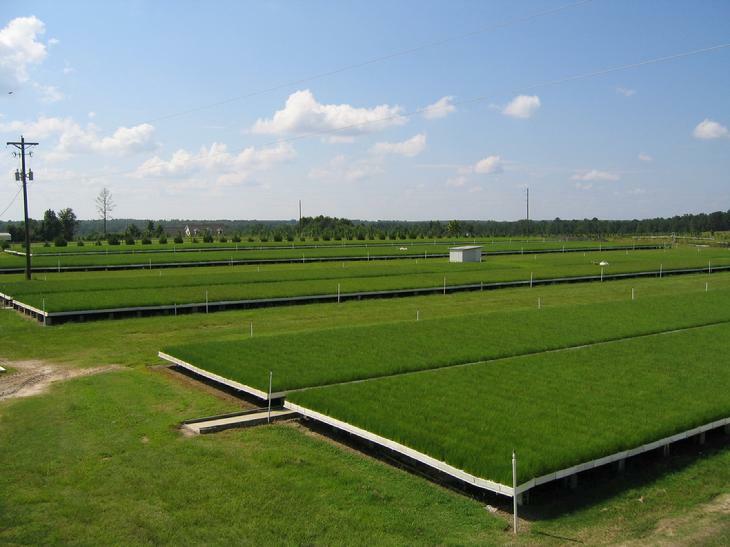 During the 28-40 week growing period our seedlings, media, tissue, and irrigation water are constantly checked and rechecked to assure they have the proper growing conditions and nutrients to achieve the maximum root collar diameter (longleaf), stem diameter (loblolly & slash), proper shoot to root ratios, and good strong healthy tops. Proper nutrient loads are addressed for out-planting on your land to assure our seedlings have a healthy start and every advantage to help customers achieve a fully stocked stand that is robust and ready to begin growth. We use a custom blended long term controlled release fertilizer to insure seedlings get off to a fast start when out-planted.